Home » Pre-Sales Questions » Can I try out a theme before I purchase? Can I try out a theme before I purchase? Making the decision about running your website with a new WordPress theme is fun and exciting. What will the new WordPress theme offer? Will your website benefit from your new theme? Will your visitors like it? These are questions you might have in mind when thinking about a new theme. What does MH Themes offer? 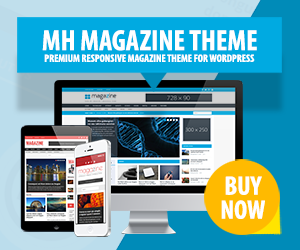 MH Themes offers a bunch of high-quality and reliable magazine themes for WordPress and we would be more than happy if you decide to use our themes, just like thousands of other happy customers from more than 110 countries around the world do as well. With over 600,000 downloads our themes are among the most popular magazine themes for WordPress on the market. Is it possible to try a theme before purchase? In general it’s not possible to try a theme before you purchase because in case of a trial we would need to send you the full theme and we can’t disable the theme after a limited period of time. That means we have no control over whether the themes are used or not, and that’s the reason why we can’t offer a trial period for our WordPress themes. But we did our best to provide you with all information you might need to make your decision for a new WordPress theme. You can have a look at our themes overview and view several demos of our themes and then decide which theme you like most to run on your WordPres website. All WordPress themes are optimized and coded properly to ensure a smooth transition from your old theme. How to decide which theme to purchase? The best way to make your decision whether you want to purchase a WordPress theme or not is to have a close look at the theme features, theme demos and also check some user sites that are running the theme and see if that’s what you want and if the theme meets your requirements. We have featured some awesome websites that are running our WordPress themes in the MH Themes Showcase. And if you have any pre-sales questions, feel free to contact us.